In order to use any of our online services, you must first complete the German SKY Alliance registration form, be accepted as a member. During registration, you are required to give your contact information including name and an email address. This information is used to contact you about the services on our site for which you have expressed interest. Demographic information may be collected to provide targeted services, incorporate network security and comply with appropriate laws regarding children. Cookies, as well as other means of personal unique identification, will be used during the registration process. However, any personal data submitted will be kept strictly confidential and used only to identify you to the registration system. German SKY Alliance has a responsibility to be accountable and transparent in how and why we collect, store and process your data. Members with access to your data are bound by our Data Protection and Handling Policy, which details and controls how we do this. German SKY Alliance has a responsibility to only collect, store, and process your data on a lawful basis. German SKY Alliance asserts it has a legitimate interest to do so in order to ensure the smooth functioning of the network and to ensure interactions between members whilst online conform to the User Agreement. This legitimate interest constitutes a lawful basis for data collection, storage, and processing. German SKY Alliance has a responsibility to ensure that data protection is managed in accord with our Data Protection and Handling Policy and our Data Protection Impact Assessment. German SKY Alliance has a responsibility to report any data breach to the appropriate authorities. You have a right to be informed why we collect your data. This policy explains these reasons to you. You have a right to access your data and view the data collected on you. This data will be released to you on written request. To protect the privacy of German SKY Alliance staff members the names of individual staff members making entries on your record and other security measures may be redacted. You have a right to rectify data you believe to be inaccurate. We encourage members to ensure details such as email address are kept up to date through the self-service membership dashboard. If you believe other data held is incorrect you can raise a support ticket with the Membership Department to seek to have it corrected. You have the right to request your data be erased from the German SKY Alliance systems. This will result in the termination of your membership of German SKY Alliance. You have the right to request we restrict the processing of your data in the event of a dispute, this may restrict your ability to connect to the network. You have the right to object to our legitimate interests. While your objection is being considered, processing of your data may be frozen, and this may restrict your ability to connect to the network. In the normal course of applying to German SKY Alliance, your personal information will be seen on Pilot Roster. This information includes full name, Callsign, Vatsim/IVAO ID, Flights, Hours and last flight. This personal information can be seen by other members and/or partners. In addition, this information may also be available to the general public via the internet. For further information regarding the availability of a member's personal statistical information, please inform us if you are against. German SKY Alliance uses IP addresses to analyse trends, administer its site, track user's movement, and gather broad demographic information for aggregate use. IP addresses are linked to personally identifiable information for the purposes of network security. German SKY Alliance may share aggregated demographic information with third parties. This is not linked to any personal information that can identify any individual person. This website contains links to other sites. 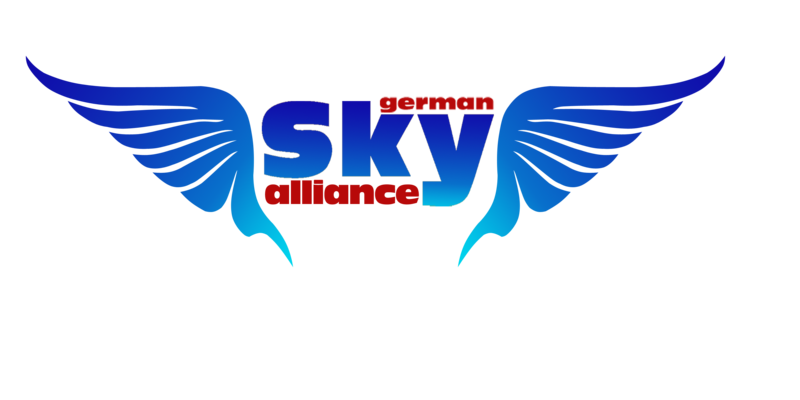 Please be aware that German SKY Alliance is not responsible for the privacy practices or policies of such other sites. German SKY Alliance encourages its members to be aware when they leave its website and to read the privacy statements of each and every web site that collects personally identifiable information. This privacy statement applies solely to information collected by the German SKY Alliance website or while connected to the network. German SKY Alliance takes every reasonable precaution to protect its members' information. When you submit sensitive information via the German SKY Alliance website, your information is protected both online and offline. German SKY Alliance will make all reasonable efforts to protect member information off-line. All member information, not just the sensitive information mentioned above, is restricted. This information is password protected and only those people who need the information to perform a specific job (for example Administrators, Staff, Membership Staff and Supervisors) are granted access to personally identifiable information. The German SKY Alliance Data Protection and Handling Policy details the circumstances and the manner under which those authorised to see and access your data may do so. All persons with such access are required to indicate their agreement to be bound by this policy before access is granted. Access to this policy itself is restricted to those individuals with a right to higher levels of access as it details internal security procedures used by German SKY Alliance to secure your data. German SKY Alliance accepts memberships from persons of the age of 13 and over. Persons aged between 13 and 16 years of age require parental consent to join German SKY Alliance and for the collection, storage, and processing of their personal data. German SKY Alliance does not accept memberships from persons younger than the age of 13 under any circumstances and without exception. In addition, German SKY Alliance does not allow any person under the age of 13 to join or post in its forum or to participate in the use of any online chat. German SKY Alliance shall make every reasonable effort to prohibit persons under the age of 13 from participating in any of these venues. Any account(s) created by persons between the ages of 13 and 16 years with parental consent obtained under false pretences, or any account(s) created under false pretences by persons under the age of 13 which are discovered and verified by German SKY Alliance shall be immediately cancelled.